A pre-curser to the zipper, Judson’s clasp was intended to be the “what’s for” when it came to walking (in a pair of shoes). 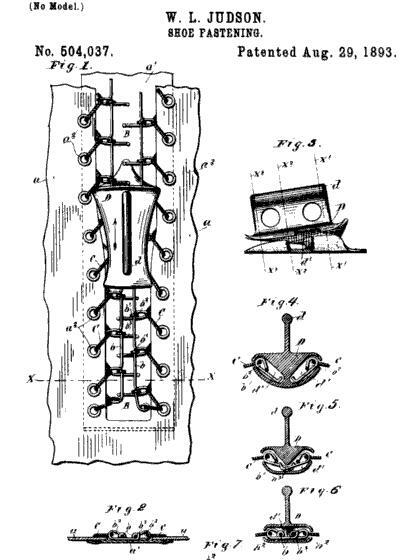 While the zipper went on to become the fastener of choice, the clasp or chain-lock fastener continued to thrive where corsets were concerned to keep pin-up gals contained far into the future. The corset of course, has a bad reputation. 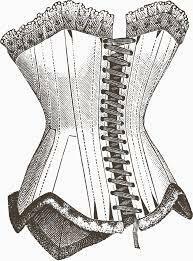 Said to cause constipation and indigestion among other health related issues and misshapen organs, it’s rumored that a doctor doing an autopsy on a body once bound by a corset who, after coming across a weird looking liver would automatically deduce “this was caused by a corset”. “The clasps may be easily and cheaply made of any suitable metal, and may be finished in any desired manner, so as to give an ornamental appearance,” Judson wrote. 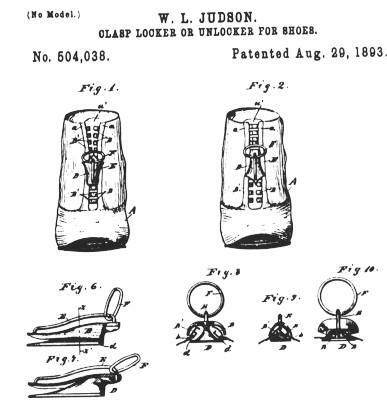 It is clear Judson’s intentions for the clasps was mainly for shoes but, Judson is recognized as the inventor of the zipper too however, Judson’s metal zipper fastener was called the clasp locker and not referred to as a “zipper” until many years after his death on December 7, 1909. According to Wikipedia, Judson’s first slide fastener patent was applied for in November 1891. At the time the United States Patent Office didn’t require a working model of a patent, only that the invention was to be a novel idea. 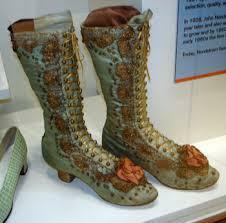 However, his invention was almost rejected by the patent assistant examiner Thomas Hart Anderson because there were already several types of shoe fasteners already patented. He applied for a second patent on an improved version for the same item some nine months later before the first was even approved. According to superbeefy.com the zipper got it’s name after Judson’s company got an order for 10,000 of the fasteners he invented. 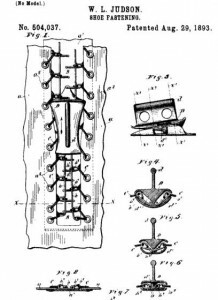 After that, B.F. Goodrich started using the fasteners on rubber rain overshoes they called “zippers” and that, is the myth revealed about the clasp that became a zipper. And that’s it about our zipper. From mail-bags to belts to the uniting of seams, Holy Levi, how else could we fasten our pants so pleasantly?